I got into sacred geometry many years ago … quite by accident. I had started playing with basic geometry when designing some mathematical imagery for a film I had written about occultists, drugs, angel, time travel and mathematics (you know the usual stuff) based on the work of Frank Belknap Long in the world of Lovecraft’s Cthulhu mythos. Whilst pottering about playing with fairly basic geometry recalled from my school days I found myself getting lost in the drawing process and in one of those inexplicable moments of – let’s say inspiration – I suddenly knew without doubt that a certain random number of steps would allow me to construct a square and circle of (very approximately, about 3% accuracy) equal area. Constructing geometrical patterns does something quite incredible to the human mind it seems. I wont even try to explain what. If you would like to experience it, as with all things, I simply suggest trying it. Not just reading about Sacred Geometry, as many, many people have done now that the subject is so well known generally, but taking the time to draw out all of the shapes and geometrical relationships yourself. I began doing this, as I said, many year ago using Photoshop, a serious inappropriate piece of software for such drawing. I have since also spent a lot of time drawing as tradition dictates: with just a compass and a straight edge. Another deeply meditative and enlightening process. My interest in such matters never really subsided but was relegated to only a small aspect of my catalogue of occult fascinations. Recently, as the Universe is want to do, Sacred Geometry was forced back into the foremost of my mind with constant reminders in my day to day life. Barely a day would go past where I would not see the Flower of Life as a necklace, on clothing, as a tattoo, on wall hangings, painted by various artists I conversed with. It seemed like everyone was talking about Sacred Geometry. I began to discuss the subject often and try and share my understanding of the Art and Practice with many people. I was rusty. I was supposed to be doing this much more seriously and with far greater skill. I knew it and I was being reminded everywhere I turned (for geometry is of course everywhere but when you really open to it, your eyes see in ways I cannot even begin to describe – all three of them 😉 ). My deep fascinations with the Ancient Greek philosophers, with western magickal traditions, with the very manner in which I have come to experience the world and its evolution; they demanded a deeper understanding of Sacred Geometry. So I began to draw again. There are a number of great sources of information on the subject. The seminal texts by Drunvalo Melchizedek of course. Also, check out the website of Charles Gilchrist who has a selection of excellent videos that introduce the basics of Sacred Geometry. Glichrist is also an extremely gifted artist and has produced a number of breathtaking Sacred Geometrical mandalas definitely worth a look. There are a countless number of different online sources of information on the Platonic Solids and Metatron’s Cube and various places you can download bitmap and vector art of many of these and their stages of construction. The quality of the imagery (and sometimes the information) varies somewhat however. After producing an Illustrator file wherein I had drawn almost all permeations of the most common Sacred Geometry constructions it occurred to me that I could take the most important ones and put them together as a free Sacred Geometry vector pack – my gift to the world and my first gesture in spreading the awareness of this beautiful and deeply spiritual practice that when fully understood can open ones eyes to the very foundations of creation itself. I will be using these extensively in the designs of my new Tarot deck as well as in a series of my own Sacred Geometrical mandalas on canvas (look out for these in the near future!). If you can make use of this imagery yourself please do, and please feel free to pass it on and share it wherever you feel others can make use of it also. The files can be downloaded here. We need this art and practice now more than ever. Thank you for the geometry pack, I love it. I’m gonna try build some websites using it. The results aren’t excellent, but maybe someone will like it. Thanks again for the template, it helped me a lot when I created a logo some days ago. Also, i recently found this super awesome geometric tool/game that allows anyone to construct and learn specific geometric fundamentals using only the “classic” method. Thank you so much for posting your work! I have also taken the time to construct much work with a compass and straightedge. I think it is essential to do physical constructions to fully grasp the geometry and to use this as a meditative practice. I did this before I did the digital vector work. Both have been valuable. I strongly recommend people follow your good example and get the ruler out! 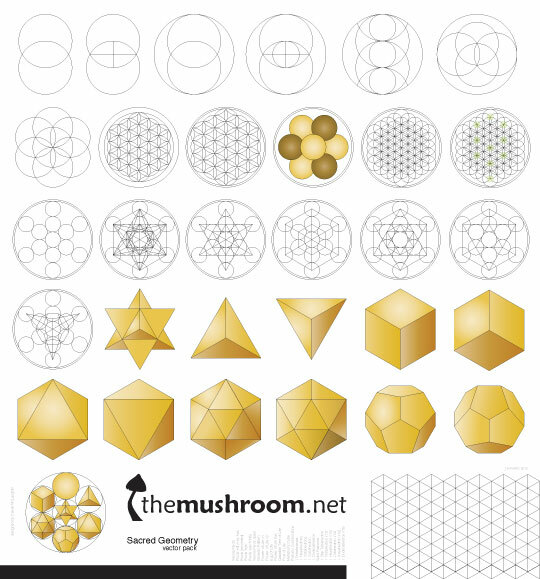 Thank you The Mushroom, keep up the good work sharing the word of geometry! Thanks. I will have to send you the vector i made with sacred geometry. Thanks a lot for the vectors and your inspiring website! Here I used your vector pack http://myrylielie.deviantart.com/art/Geomtry-of-a-Dream-405727958 hope you like it. Thanks for being so generous with your sacred shapes! I’m planning on trying some out on my laser projector. I’ll post a video when I have some results – which may be a while as I’m learning new software. Amazing! Definitely do. I’d love to see the results. I will definitely have a look. Thank you.